In line with our commitment to help keep your skin not only beautiful but healthy as well, we’re giving you this roundup of the best sunscreens for oily skin. We picked these products based on their level of protection, compatibility with oily skin and additional skin benefits. Obagi Medical Sun Shield Matte Sunscreen Lotion has an SPF level of 50. Aside from that it's matte, it's also lightweight which are two things your oily skin will surely love. Clinique Super City Block Ultra Protection contains the least amount of product in this list. This, however, doesn't mean that it falls short when it comes to result. The product actually comes with a handful of benefits for your skin type. Containing an SPF level of 60, La Roche-Posay Anthelios Clear Skin Dry Touch Sunscreen promises to stay on your skin for 80 minutes even with underwater use. It's noncomedogenic and fragrance-free- two ingredients that can keep your oily skin from breaking out. Eucerin Daily Protection Moisturizing Face Lotion is formulated to provide the skin with 24 hours of moisture. It's a perfect choice for people who have excess oil and sensitive skin at the same time. If you are looking for an organic choice, then you shouldn't miss Kimberly Sayer Ultra Light Facial Moisturizer. It has a nice refreshing citrus scent and a property that makes it work well even when used under makeup. Most sunscreens feel heavy on the skin and the heavier they are, the less likely you’ll stick to using them. This is one of the best features I found in this product. Aside from that it’s lightweight, it’s also easy to apply. Obagi Medical Sun Shield Matte Sunscreen Lotion is free from PABA and fragrance. As for protection, it has a high SPF level at 50 with its zinc oxide and octinoxate content. Although helpful in protecting your skin against the sun’s harmful rays, this type of SPF protection can leave a white cast during flash photography so don’t feel surprised if you see your face a bit whiter than normal. For oily skin, this sunscreen spells good news as it leaves a matte finish. You won’t have to worry about looking greasy and feeling sticky while outdoors. Clinique Super City Block Ultra Protection contains only 1.4 ounces but don’t let its small quantity make you doubt its capabilities. For one, this sunscreen offers a broad spectrum SPF 40. It has a light tint that blends easily to the skin. It won’t leave any trace of color behind- of course, you’ll have to blend the product well. What I find interesting in this one is that it has both titanium and zinc oxide. Despite being a sunscreen, it’s also packed with antioxidants, like vitamins C and E as well as cucumber extracts. The combination of these properties is actually really good since there are studies that suggest that antioxidants work better when partnered with broad-spectrum sunscreens. If you have an oily skin that’s also sensitive, it might be a good idea to skip this product. It contains citrus extracts that can potentially cause irritations. La Roche-Posay Anthelios Clear Skin Dry Touch Sunscreen has an SPF level of 60. It’s non-comedogenic and ca absorb oil to keep you shine-free. Aside from being oil-free, it can also be expected to last for 80 minutes of underwater use. Impressive, right? The sunscreen has a thick consistency but this doesn’t make it hard to apply. In fact, it has great absorbency and dries almost instantly. You’ll love that the product is also packed with antioxidants so you’re also protected against free radical damage. 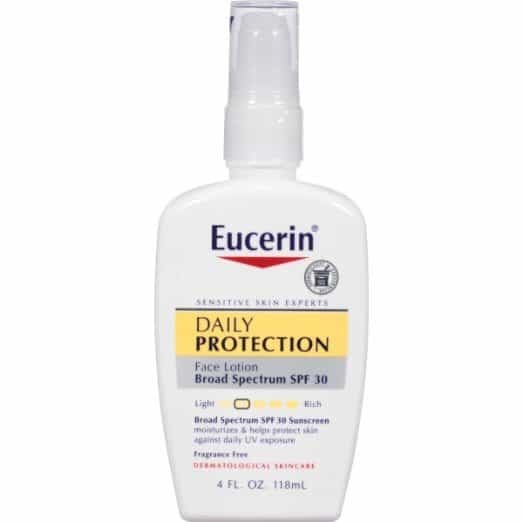 Eucerin Daily Protection Moisturizing Face Lotion has an oil-free formulation that is fast-absorbing. It’s lightweight, free from fragrances and claims to be gentle even on sensitive skin. Despite its ability to provide 24 hours of moisture, this one isn’t greasy. It does, however, leave a bit of a film when applied so make sure you also have a mirror with you during application. It only takes a few seconds to get absorbed which means you won’t have to wait too long for it to dry. The best part of this product is that it’s quite affordable. For its size, I can say this one won’t break holes in your budget. Kimberly Sayer Ultra Light Facial Moisturizer comes in a handy pump bottle. It’s a convenient choice if you’re a frequent traveller or just don’t want to clutter your vanity space too much. The product is lightweight which makes it great under makeup. It won’t make your foundation smudge or budge. The best thing about this product is that it’s made with natural ingredients. Its sun protective components are composed of botanical sunblock. It also has Oat Beta Glucan to fight the oxidative damage typically caused by free radicals. I also find this sunscreen’s scent nice. It has a light citrus scent that feels refreshing at the same time. And that’s not just limited to the scent. The product actually has vitamin C and lemon oil which you have to be wary of if you have sensitive skin. When you have oily skin, the last thing you want to happen is to grab a sunscreen that can clog your pores and make things a lot worse. An oily skin can already cause a lot of inconvenience and getting nasty breakouts to go with it is another more difficult story. Well, let’s not focus on that. Shall we? Sunscreen is an essential skin care item for any skin type. Aside from the protection it gives against UV damage, it can also help slow down the signs of skin aging, such as fine lines and wrinkles. Sunscreens for oily skin are a bit difficult to find since you need to have the right ingredients and formulations that won’t clog your pores or dry your skin out. They are also more expensive because of the same things. Essentially, you need to keep these things in mind when selecting the right sunscreen for oily skin. Look for a sunscreen that has an SPF 15 and higher. If you can find a broad spectrum sunscreen, that would be better. As for formulation, pick one that’s water-based. Skip the thick creams as they can only clog your pores. Your sunscreen should also be non-comedogenic and oil-free. Sunscreens aren’t always likable, especially when you get the grease and shine right after application. Yes, we’ve all been there. Despite these issues, however, you still shouldn’t skip sunscreen- even during winter. So, instead of focusing on how wrong your sunscreen will look on your skin, you should focus on how to apply it properly. Do a proper skin care routine. Cleansing, toning and moisturizing your skin with oily skin-friendly products will keep your pores from producing too much oil. Apply your sunscreen and blend it well on your skin. Make sure that there aren’t any visible streaks, especially near your hairline. After it has set, use a blotting paper or a piece of tissue to absorb any residue of the product. You can also dust your face with a powder. If you are going to apply makeup after, be sure to let it set first to avoid clumping your foundation with oil. Wearing sunscreen can save you a lot of skin issues in the long run. However, with the sticky and greasy feeling you can get from it, you may find the experience of applying it cringe-worthy. To help you out, we’re recommending Obagi Medical Sun Shield Matte Sunscreen Lotion as the best sunscreen for oily skin for two reasons: it’s matte and has added skin benefits. It does lean on the expensive side but with the great things it can do for your skin, you can think of it as an investment and a good way to avoid premature skin aging and even skin cancer.